The Boston Celtics now possess a three-to-two game lead over the Cleveland Cavaliers in the 2018 NBA Eastern Conference Finals, and the Marcuses defense of LeBron James are a big part of the reason why. Of course, I am talking about Marcus Morris and Marcus Smart here, whose gritty on-court performances come as close to anything as a LeBron stopper can in recent years. Now, the Celtics find themselves in a position to close out the Cavaliers on LeBron's home court, and meting out a bit of payback to the man who's blocked Boston's path forward in the finals for much of the last decade. It'll be difficult, but "Scary" Terry Rozier thinks it can be done - even considering how "scary" his efficiency was last night. Rozier is usually the Garden Assassin, so if the Cs can win at home when he's having an off night - and win handily - they might just take the day if he clicks on the road. 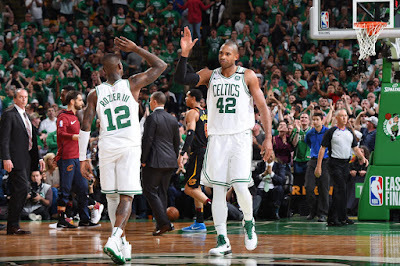 Watch the videos below to hear what Smart, Morris, and Rozier had to say about Game Five - and how they are feeling about Game Six going forward.